At the foot of the page is the account of Lot 5 from the catalogue of the 1919 auction. G. J. Clements, Chelmsford. 24th. January, 1961.. This farm of about 120 acres was situated at the end of Straight Road. Most of the land was on the eastern side. The house and buildings were also on the eastern side but stood well back from the road. They were approached by a chase just south of where Hailsham Road now enters Straight Road, The farm house, of red brick and tile, was probably Georgian (circa.1720). There were two floors and attics. As the roof descended to ground floor level at the rear, all the principal rooms faced west. The front door opened upon a rather narrow passage with stairs concealed at the far end. The drawing room was to the left and the dining room to the right of the passage. The kitchen, with a window facing south, was behind the dining room and the dairy behind that. On the first floor the three main bedrooms were in line and on the second were the two large attics. The substantial buildings of red brick and timber were probably of a somewhat later date than the house. (1) The farm was originally known as Brick-Kiln Farm. Thus the site's former use is denoted . Brick making was a localised rural industry and many similar kilns were to be found in Essex up to the beginning of the Nineteenth Century. (2) Very little is known of the farm's early history, probably it was part of the Neave family's estate of Dagnam Park for most of its existence. 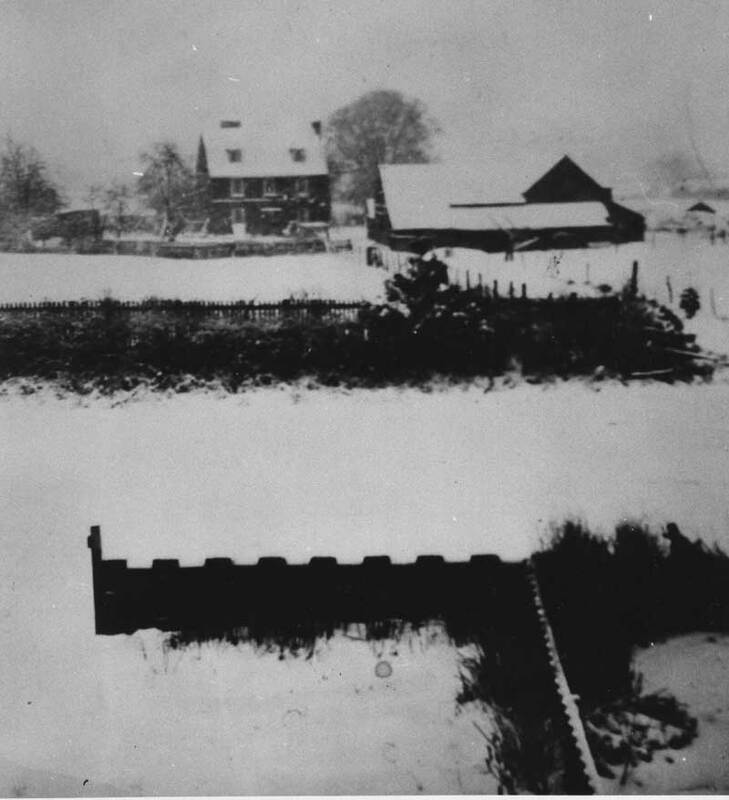 In 1919, Brick-Kiln Farm was purchased by Mr.A.S. Goodwin of Hollowdene, Wanstead who, doubtless with his old home in mind, renamed it Hilldene Farm. Mr. Goodwin handed the farm over to his two nephews who farmed it under the style 'Goodwin Brothers. After a few years the partnership was broken up and the farm sold to a Mr.Goodchild but Mr. S.J.Goodwin stayed on as tenant until 1949, (3). In 1946 the farm was taken over by the London County Council in connection with the development of Harold Hill and late one night during the December of the following year, a fire occurred which left the house a mere shell. The occupants, Mr. and Mrs.S.J. Goodwin and their younger daughter, escaped unhurt and for the remainder of their tenancy resided in one of the two farm cottages. This pair of cottages was situated in Straight Road approximately where Hilldene Avenue now joins it. They were solid mid Victorian constructions of plum coloured brick with gables and slate roofs. The house was finally demolished in January 1950 and the farm buildings and cottages followed about a year later. In 1951 most of the land belonging to the farm on the eastern side of Straight Road was developed for residential purposes. About four years later, Harold Hill Grammar School was built near to the Straight Road - Noak Hill Road Cross Roads. 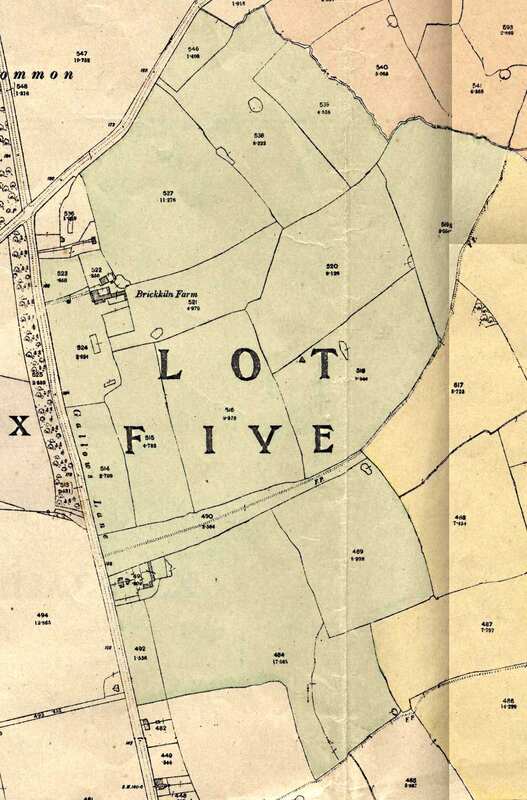 Apart from the school grounds with a frontage to Noak Hill Road, the only part of the farm not built over at the present time is a large field on the western side of Straight Road which also has a frontage to Lower Bedfords Road. This continues under cultivation. Although the farm has ceased to exist, the London County Council have perpetuated its memory by naming a main thoroughfare "Hilldene Avenue." 1. The writer's parents lived opposite the farm for ten years and this description is from their recollections. 2. Confirmed by Mr.H.W.Farman after he had given a paper on "Early Essex Brickwork" before the Romford & District Historical Society on the 26th September, 1960. 3. Mr. S. J". Goodwin, now of Great Dunmow, was interviewed during November, 1960. 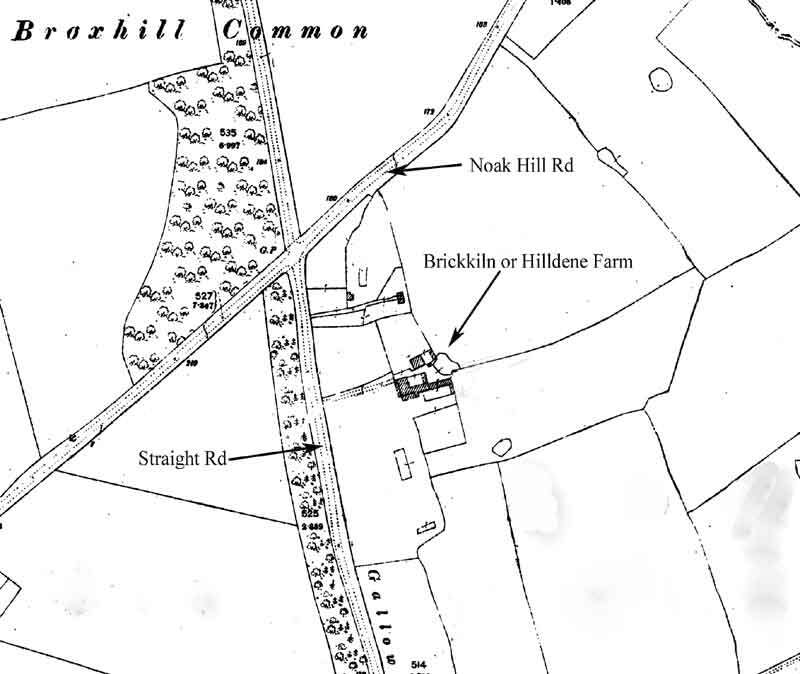 Earlier History of Brick Kiln Farm taken from E Herbert's Farms of Harold Hill and Noak Hill. Containing : Five Bed Rooms, Two Sitting Rooms, Kitchen with Larder and Detached Wash House and Coal Shed. Each containing Three Bed Rooms, Living Room, Kitchen, Pantry, Coal Shed and detached Wash-house. The whole Farm comprising : 112a. Ir. 27p. of Arable and Pasture Land. Mr. J. Quilter : 104a. or. 15p. at £135 per annum on a Yearly Tenancy. Mr. C. Brooks : 8a. Ir. 12p. at £10 per annum on a Yearly Tenancy. G.P.O. acknowledgment rent for Telegraph Pole at Is. Yearly. Total Rent of £145. per annum. Outgoings : Tithe Rent Charge (commuted amount) £15. Is. 4d. Land Tax (on 55 acres): £3 10s Od. The occupiers were Mr. J. Quilter and Mr. C. Brooks. The Purchaser was Mr. Alfred Goodwin, who paid £5,000 for Lots 5&6.